Unlike HorseWorld, which focused on the care and grooming of horses on an idyllic equestrian farm, HorseWorld: Show Jumping offers the opportunity to start your very own career as an international show jumping rider. In Show Jumping, players visit a variety of countries, in which they clear a wide range of increasingly difficult show jumping courses. The right timing and a strong connection between horse and rider are essential to success here. If this sounds like a challenge, that’s because it is! Fortunately, players have the chance to improve their skills and their relationship with their horse. To improve your timing, for instance, you can focus on this key element of competitions in a training feature designed specifically for this purpose. 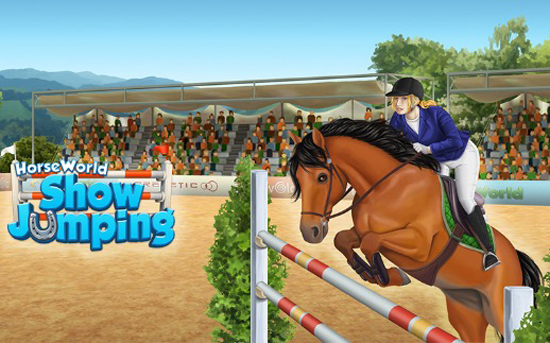 Players can also build their own show jumping courses, choosing between different obstacles and how to clear them. This allows players to adjust the level of difficulty to their own personal taste. Off the course, players can feed, groom and cuddle up to five different horses on their virtual farm. This loving care will pay off in the long run through increased performance as well as coins, which allow you to unlock decorations for your farm, additional courses and horses. It really pays to be kind. HorseWorld: Show Jumping is the latest game by Tivola, winners of the German Developer Prize 2016 in the category “Best Games-Publisher”. It is now available worldwide on iOS and Android. The mobile game can be downloaded for free through the App Store, Google Play and the Amazon Appshop and includes IAP (in-app-purchases) which unlock additional content.